Before arming, the system starts the Exit Delay to give you enough time to exit the protected area. The READY Light will flash during the Exit Delay and the keypad may beep. To disarm an armed system or an alarm, enter your access code. An entry point, like the front door, will be programmed with an Entry Delay. When an entry point is opened, your alarm system will not generate an alarm until the Entry Delay elapses or you disarm the system. Any code can disarm the system except User Code 7 (Regular Arm Only). How Do I Deactivate an Alarm? How Do I Disarm the System? For a Stay Armed system, go to Step 2. 1) Enter through an entry point (i.e. front door). After the Confirmation Beep, the ARM Light will turn off. This method, commonly used for day-to-day arming, will arm all the zones in the system. How Do I Regular Arm? 1) Close all zones in the system. When you have correctly armed the system, the Exit Delay (see section 4.1) will start and the ARM Light will turn on. Please note that you can Regular Arm by using One-Touch Arming. This method allows you to remain in the protected area while partially arming the system. Certain zones are programmed as Stay Zones, which are bypassed when Stay Arming. For example, when you go to sleep at night, doors and windows can be armed without arming other zones like motion detectors. How Do I Stay Arm? 1) Close all zones except Stay Zones. Force Arming allows you to arm the system without waiting for all zones in the system to close. Certain zones are programmed as Bypass Enabled Zones, which are bypassed when Force Arming. When Force Arming, a Bypass Enabled Zone is considered deactivated until it closes. Once it closes, the zone is armed. 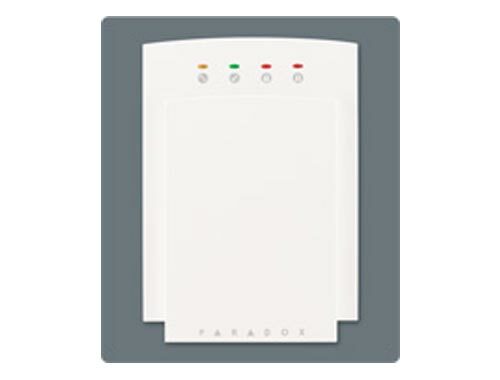 Force Arming is commonly used when a motion detector is protecting the area occupied by a keypad. For example, when you are in the path of a Bypass Enabled motion detector, use Force Arming to arm the system. How Do I Force Arm? 1) Close all zones except Bypass Enabled Zones. When you have correctly Force Armed the system, the Exit Delay will start (see section 4.1) and the ARM Light will turn on. Bypass Programming allows you to program the system to ignore (deactivate) specified zones the next time the system is armed. For example, you can bypass certain zones when you are renovating. The Fire Zone and zones that are not Bypass Enabled by your installer cannot be bypassed. How do I Bypass Zones? 1) Press the [BYP] button. 3) Press the button(s) corresponding to the zones that you want to bypass. Illuminated buttons represent bypassed zones. To unbypass a zone, press its corresponding button to extinguish it. Bypass Recall allows you to bypass the same zones that were bypassed previously at the touch of a button. How do I use Bypass Recall? If desired, you can modify the entries by pressing the button(s) corresponding to the zones that you want to change. One-Touch Arming allows you to arm the system without using an access code. Your installer can program Onetouch Arming to either Regular or Stay Arm your system. You can use this feature to allow specific individuals like service personnel (i.e. cleaners) to arm without giving them access to any other alarm system operations. For details on Regular Arming, see section 4.3. For details on Stay Arming, see section 4.4. How do I use One-touch Arming? Press and hold the [ENTER] button for 2 seconds. Keypad Chimes and Muting must be reprogrammed if your system suffers a total power loss. When you press and hold the button (as described in section 5.1 and section 5.2) and the keypad emits a Confirmation Beep, the Chime feature has been enabled for that zone or Keypad Muting has been enabled for that keypad. If the keypad emits a Rejection Beep, these features have been disabled. This feature allows you to program which zones will be Chime Enabled. A Chime Enabled zone will advise you every time it is opened by causing your keypad to emit a rapid intermittent beep tone (BEEP-BEEP-BEEP-BEEP). Press and hold any button from  to  for 3 seconds to activate or deactivate Chiming for zones 1 to 6 (also see note above). For example, press and hold the  button to enable Chiming on zone 1. Press and hold the [CLEAR] button for 3 seconds to enable or disable keypad muting. When muted, the keypad will only emit the Confirmation Beep, the Rejection Beep, and beep when a button is pressed. In case of emergency, the Spectra 1727 system can provide a panic alarm that can immediately generate an alarm after simultaneously pressing and holding the  and  buttons for two seconds. Your Spectra 1727 system may include one or two programmable outputs (PGMs). When a specific event or condition occurs in the system, the PGM can be used to reset smoke detectors, activate light switches in your home or office, open/close garage doors and more. A PGM can also be programmed to activate whenever the [PG] button is pressed. The following sections provide you with an introduction to the buttons and indicator lights on your keypad. The installer must enable many of the system’s features. If the feature is not programmed, the keypad will emit a Rejection Beep and the action will be cancelled. Confirmation Beep: When an operation (i.e. arming/ disarming) is successfully entered or when the system switches to a new status/mode, the keypad emits an intermittent beep (BEEP-BEEP-BEEP-BEEP). Rejection Beep: When the system reverts to previous status or when an operation is incorrectly entered, the keypad emits a continuous beep tone (BEEEEEEEEP). All Spectra LED Keypads include colored lights which convey your system’s current status. The state of each light represents a specific condition in your system. The numerical buttons on the 1686V/H Keypads are designed to communicate the status of the zones in your system. Each button corresponds to a zone in your system. If a button’s light is off (extinguished), the corresponding zone is closed. If a button’s light is on (illuminated), the corresponding zone is open (i.e. open door, movement detected, etc.). If an alarm has occurred on a zone, the [MEM] button will illuminate. All zones where alarms occurred will be stored in the memory. After disarming the system, press the [MEM] button to illuminate the buttons corresponding to the zones that were in alarm. To exit the Alarm Memory Display, press the [CLEAR] button. The system will erase the contents of the Alarm Memory every time the system is armed. 1 System Master Code 7 User Access Codes. The System Master Code can arm or disarm the system using any of the methods described in section 4.0 and can create, modify or delete any User Access Code(Default: 123456). Your system can use either 4- or 6-digit Access Codes, where each digit can be any value from 0 to 9. Six-digit codes are considered more difficult to “crack” and, therefore, more secure. Avoid programming simple or obvious access codes, such as your telephone number, address or codes such as 1234. How Do I Program Access Codes? [ENTER] flashes. Return to step 3 to program another code. Upon a fire alarm, the bell/siren will squawk every 0.5 seconds until silenced or reset by entering a valid access code. What do I do if a Fire Zone was set off accidentally? 1) Enter your [ACCESS CODE]. 2) Try to correct the problem. 3) If the problem persists, the alarm will sound again. Enter the [ACCESS CODE] again. Cooking is the leading cause of home fires in the U.S and the leading cause of fire injuries. Cooking fires often result from unattended cooking and human error rather than mechanical failure of stoves or ovens. Careless smoking is the leading cause of fire deaths. Smoke detectors and smolder-resistant bedding and upholstered furniture are significant fire deterrents. Heating is the second leading cause of residential fires. However, heating fires are a larger problem in single family homes than in apartments since the heating systems in single family homes are often not professionally maintained. In the event of a fire, remember time is the biggest enemy and every second counts! Escape first, then call for help. Develop a home fire escape plan and designate a meeting place outside. Make sure everyone in the family knows two ways to escape from every room. Practice feeling your way out with your eyes closed. Never stand up in a fire, always crawl under the smoke and try to keep your mouth covered. Never return to a burning building for any reason; it may cost you your life. Having at least one working smoke alarm dramatically increases your chances of surviving a fire. Remember to practice a home escape plan frequently with your family. Household fires are especially dangerous at night. Fires produce smoke and deadly gases that can overcome occupants while they sleep. To warn against fire, smoke detectors should be installed outside each separate sleeping area in the immediate vicinity of the bedrooms and on each additional story of the family living unit, including basements. With the system disarmed and the READY Light on, activate motion detectors by walking in the protected area. Open and close protected doors and verify that the corresponding button illuminates. Do not use an open flame or burning materials to test your fire detection devices. Your installer can advise you of the best way to test your particular system. Under normal use, your system requires virtually no maintenance other than regular testing. It is recommended that the standby battery be changed every three years. Speak to your installer about the necessary tests and at what frequency they should be performed. © 2017 ADT Services AG. All rights reserved.